I went to the Providence Wintertime Farmers’ Market this Saturday and, with lots of anticipation and excitement, picked up a pint of fresh ricotta cheese from the Narragansett Creamery’s table and a tub of beautiful organic pea greens from Allen Farms in Westport. I knew then that these wonderful ingredients would make the perfect wheat berry salad later in the week. If you’ve never tried pea greens then you’re in for a treat. Imagine the lovely sweet taste of spring peas in the form of crisp fresh leaves. I thought the combination of the root vegetables and the fresh pea greens in this salad would pay perfect homage to the season – marking the end of a long winter and enthusiasm for spring harvests. I was inspired to accompany this salad with the ricotta by one of my favorite dishes at one of my favorite restaurants in Providence: La Laiterie (have you been? It’s fabulous! …wait forget I said that, my husband and I already have to wait an hour plus for a table!). 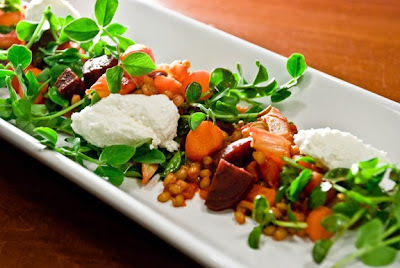 La Laiterie serves a delicious roasted beet salad that’s dotted with a creamy feta cheese and kumquats. With the addition of the whole grain wheat berries in my version, this salad feels more like a main meal than a first course. BTW… if you live in Southern New England and you’ve never been to the Providence Wintertime Farmers’ Market in Pawtucket then prepare for a delight! Carved out of an old mill building, it’s table after table of wonderful artisanal foods from throughout New England. On any given Saturday you can expect to find a variety of local cheeses, breads, jams, salsas, sprouts, eggs, milk, and much more! Line a sheet pan with aluminum foil and spray with olive oil. Add the beets, carrots and fennel to the tray and spray with a bit more olive oil. Roast for 1 hour, stirring occasionally. In a large bowl whisk together the orange zest, orange juice, and vinegar. Add the roasted vegetables, cooked wheat berries, pea greens, and toss until well combined. Season with salt and pepper to taste. Serve with the fresh ricotta cheese. Enjoy! Great blog. Thanks for the tips. I can't wait to go to La Laiterie and the farmers market. The recipes look great and I can't wait to try them.